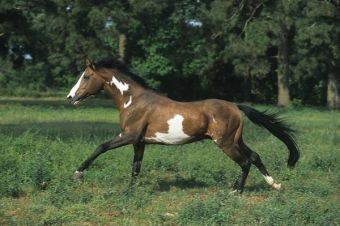 Nite Spot is a rare bay frame overo 16.1 hh Thoroughbred stallion. Formerly standing at stud in Mascot, Tennessee he has now moved to a new home in Germany. He has competed successfully in the hunter ring and has produced several successful hunters. Thankyou to Gwendoline Gregorio of Falkenhorst Gestuet Falkenhorst, Neustadt an Der Orla, Germany for allowing me to display this photo of her superb stallion.